ABSTRACT. Chronic kidney disease (CKD) is a major public health problem. Conflicting evidence exists among community-based studies as to whether CKD is an independent risk factor for adverse cardiovascular outcomes. After subjects with a baseline history of cardiovascular disease were excluded, data from four publicly available, community-based longitudinal studies were pooled: Atherosclerosis Risk in Communities Study, Cardiovascular Health Study, Framingham Heart Study, and Framingham Offspring Study. Serum creatinine levels were indirectly calibrated across studies. CKD was defined by a GFR between 15 and 60 ml/min per 1.73 m2. A composite of myocardial infarction, fatal coronary heart disease, stroke, and death was the primary study outcome. Cox proportional hazards models were used to adjust for study, demographic variables, educational status, and other cardiovascular risk factors. The total population included 22,634 subjects; 18.4% of the population was black, and 7.4% had CKD. There were 3262 events. In adjusted analyses, CKD was an independent risk factor for the composite study outcome (hazard ratio [HR], 1.19; 95% confidence interval [CI], 1.07–1.32), and there was a significant interaction between kidney function and race. Black individuals with CKD had an adjusted HR of 1.76 (95% CI, 1.35–2.31), whereas whites had an adjusted HR of 1.13 (95% CI, 1.02–1.26). CKD is a risk factor for the composite outcome of all-cause mortality and cardiovascular disease in the general population and a more pronounced risk factor in blacks than in whites. It is hypothesized that this effect may be due to more frequent or more severe subclinical vascular disease secondary to hypertension or diabetes in black individuals. Chronic kidney disease (CKD) is a major public health problem. On the basis of clinical practice guidelines established by the National Kidney Foundation, ∼20 million adults in the United States have CKD, with 8 million of these classified as having moderate or severe kidney disease (1). In dialysis patients, cardiovascular disease (CVD) mortality rates are 10 to 30 times higher than in the general population (2). In high-risk patients, defined by the presence of either CVD or cardiovascular risk factors, less severe kidney disease is also an independent risk factor for CVD outcomes (3–12⇓⇓⇓⇓⇓⇓⇓⇓⇓). However, in more representative community-based populations that were not selected for being at increased risk for CVD, there have been less consistent findings. Data from some studies suggest the absence of an independent association between the presence of CKD and CVD (13,14⇓), whereas other data suggest that CKD is an independent risk factor for CVD outcomes (15–18⇓⇓⇓). Previous studies may have been limited by insufficient power to examine subgroup relationships, in particular race, which may have caused discrepancies in these results. The purpose of the present study was to pool the findings from several large community-based cohort studies to evaluate more systematically whether CKD, as quantified by estimated GFR, is a risk factor for CVD. This large and diverse database provides sufficient power to investigate the effect of moderate and severe CKD on outcomes in subjects without CVD at baseline. In addition, it provides the opportunity to identify high-risk subgroups. We were particularly interested in differences between black and white subjects, as a previous analysis by our group revealed a trend toward a differing impact of CKD depending on whether subjects were black or white (18). This study is a secondary evaluation of four community-based, longitudinal public-use data sets to ascertain the relationship between baseline kidney function and long-term risk of CVD and all-cause mortality. The cohorts used were the Atherosclerosis Risk in Communities Study (ARIC), the Cardiovascular Health Study (CHS), the Framingham Heart Study (FHS), and the Framingham Offspring Study (Offspring). Importantly, these four studies all have meticulous ascertainment of CVD events during their follow-up periods. Between 1987 and 1989, ARIC enrolled 15,792 participants aged 45 to 64 yr from Jackson, Mississippi; Forsyth County, North Carolina; the northwestern suburbs of Minneapolis, Minnesota; and Washington County, Maryland. The Mississippi cohort is entirely black and composes >80% of the black individuals in ARIC. CHS is a population-based study of 5201 subjects 65 yr and older randomly selected from Medicare eligibility files during 1989 and 1990 from four different communities: Sacramento County, California; Washington County, Maryland; Forsyth County, North Carolina; and Pittsburgh, Pennsylvania. An additional 687 blacks were recruited in 1992 and 1993. FHS began in 1948 with 5209 residents of Framingham, Massachusetts, aged 28 to 62 yr. Serum creatinine levels were initially assessed at the 15th biennial examination (1977–1979; n = 2632) in FHS. Offspring recruited 5124 of the children and the spouses of children of FHS participants in 1971, and serum creatinine was assessed at the second examination (1979–1983; n = 3863). Therefore, the 15th examination in FHS and the second examination in Offspring were considered to be the baseline period for our current analysis. Details of recruitment and procedures for all studies have been described elsewhere (19–22⇓⇓⇓). ARIC assessed baseline creatinine in 15,582 (99%) subjects at baseline using the modified kinetic Jaffé method (alkaline picrate). Serum creatinine in CHS was assessed at baseline by the Kodak Ektachem 700 Analyzer, in 5716 (97%) subjects. FHS and Offspring assessed creatinine using either an autoanalyzer technique or the creatinine amidohydrolase assay in 2536 (96%) and 3703 (96%) subjects, respectively. The Modification of Diet in Renal Disease (MDRD) Study equations for estimating GFR were derived by comparing GFR assessed by kidney clearance of iothalamate with demographic characteristics and laboratory values (23). Serum creatinine in the MDRD study and subsequently in a subset of individuals included in the Third National Health and Nutrition Examination Survey (NHANES III) both were analyzed at the Cleveland Clinic laboratory (24). Because creatinine values vary across clinical laboratories, serum creatinine data in our current study were calibrated to the Cleveland Clinic laboratory indirectly by using NHANES III data. Because both NHANES III and the studies used for the pooled sample were designed as population samples and NHANES III data have been compared directly to the MDRD study samples, it was assumed that the mean serum creatinine in the four original studies for a given age, race, and gender should be comparable to NHANES III. A linear regression of data combining each study individually with NHANES III showed that serum creatinine values were 0.24 mg/dl higher in ARIC, 0.11 mg/dl higher in CHS, 0.04 mg/dl higher in the CHS black cohort, 0.22 mg/dl higher in FHS, and 0.32 mg/dl higher in Offspring than among NHANES III participants. Similar calibration corrections have been made by the CHS investigators to pool the two CHS cohorts and the Framingham investigators to pool data from the FHS and Offspring (25). These values were then subtracted from measured creatinine levels before use in the current study. GFR was estimated using the four-variable MDRD formula as follows: GFR = 186.3 × (serum creatinine−1.154) × (age−0.203) × 1.212 (if black) × 0.742 (if female). Serum creatinine is measured in mg/dl, age is in years, and GFR is expressed in ml/min per 1.73 m2 (23,26⇓). GFR was subsequently dichotomized, and subjects were classified as having CKD when their GFR values were <60 ml/min per 1.73 m2. Subjects with a GFR of <15 ml/min per 1.73 m2 were excluded from the study to avoid confounding by imminent dialysis. Baseline characteristics included demographics (age, gender, race, and education level), lifestyle (smoking and alcohol intake), medical history (baseline CVD, diabetes, and hypertension), medication use (antihypertensive agents, lipid-lowering agents, and diabetes medications), physical examination findings (height, weight, body mass index [BMI], systolic and diastolic BP, and left ventricular hypertrophy [LVH] by electrocardiogram), and laboratory variables (total cholesterol, HDL cholesterol, creatinine, and glucose). The methods used for collection of baseline data by each of these studies have been described previously. Age in CHS was provided in 2-yr groups. Subjects were assigned the mean age for that group to create a continuous variable comparable with the other studies. Race was defined as white or black. The Framingham cohorts were assumed to be entirely white (27). Education level was dichotomized according to whether the subject graduated from high school. Cigarette smoking and alcohol use were dichotomized as current users and nonusers. For ARIC, CHS, and Offspring, diabetes was defined as the use of insulin or oral hypoglycemic medications or a fasting glucose level ≥126 mg/dl. Although the measurement of serum glucose in FHS was based on a casual measurement with respect to fasting, for the primary analysis diabetes was also defined by use of diabetes medications or serum glucose level ≥126 mg/dl. Hypertension was defined as systolic BP ≥140 mmHg, diastolic ≥90 mmHg, or use of an antihypertensive medication. BMI was calculated using the formula weight (kg)/height2 (m). Total cholesterol and HDL cholesterol were measured in all studies. Urinalysis results were not available for all studies; therefore, proteinuria was not included as a variable. LVH was derived from electrocardiographic criteria. Baseline CVD included a history of both recognized and silent myocardial infarction (MI), angina, stroke, transient ischemic attack, and intermittent claudication as defined by consensus committees for the respective studies. In addition, baseline CVD included a history of congestive heart failure in CHS, FHS, and Offspring (not coded in ARIC) and a history of angioplasty and coronary bypass procedures in ARIC and CHS (not available in the Framingham cohorts). The methods used for definitions of CVD outcomes by each of these studies have been described extensively elsewhere (19–22⇓⇓⇓). We excluded 575 subjects who had data missing on age, race, gender, or creatinine or were of nonwhite/nonblack race; 36 subjects with GFR <15 ml/min per 1.73 m2; 93 subjects who did not provide permission to release data; three subjects without follow-up data; 556 subjects with missing baseline CVD data; and 4278 subjects with preexisting CVD. After these exclusions, the final study population consisted of 22,634 subjects. A total of 602 subjects had missing single data points, such as systolic BP and total cholesterol; for these subjects, single imputation was performed on the basis of age, gender, and race stratified means. Analyses were performed using both the imputed and nonimputed data. Final models are based on the imputed results. Because only the Framingham cohorts had >10 yr of follow-up data, we censored all subjects at 10 yr for follow-up times to be similar among the studies. The primary study outcome was a composite of MI, fatal coronary heart disease (FCHD), all-cause mortality, and fatal and nonfatal stroke. MI was defined by both clinically recognized and silent infarctions. Secondary outcomes included individual analyses of three outcomes: cardiac events (MI and FCHD), stroke, and all-cause mortality. Data were stratified by CKD status on the basis of GFR of 60 ml/min per 1.73 m2. χ2 tests and ANOVA were used to compare baseline data between subjects with and without CKD as well as between whites and blacks. Kaplan-Meier survival analysis was used to compare survival times among patients with CKD versus those without CKD. The log-rank statistic was used to test for differences among groups. Cox proportional-hazards regression was used to examine the differences in the principal study end points between the respective comparison groups while adjusting for various covariates. All models included traditional CVD risk factors described in the Framingham population, namely age, gender, smoking status, systolic BP, total cholesterol, HDL cholesterol, diabetes, and history of hypertension. Additional candidate covariates included LVH, alcohol use, BMI, and education status; these were retained when P < 0.05 in the multivariate model. Terms for original study were included in the models to test that studies were not inherently different. We also tested for interactions between CKD status and the major CVD risk factors (including race) defined above. The proportional hazards assumption was tested using a time-varying coefficient model testing for global and individual covariates. Graphical analysis of racial differences was performed using data from the fully adjusted model with an interaction term for race and GFR. 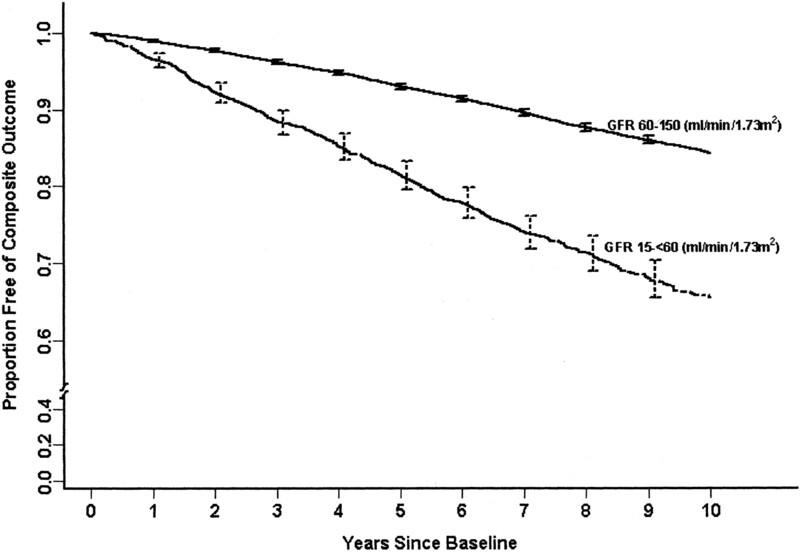 With the use of a cubic spline function, GFR was plotted as a continuous variable (with levels >150 ml/min per 1.73 m2 truncated to this level) versus the probability of developing the composite outcome over a 10-yr period. Two sensitivity analyses were performed to account for potential differences among the original studies: (1) analyzing two other definitions of diabetes in FHS, the first defining diabetes as serum glucose ≥200 mg/dl or use of antihyperglycemic medications at Visit 15 and the second defining diabetes as any serum glucose ≥200 mg/dl or any use antihyperglycemic medications at or before visit 15 and (2) Examining for an interaction between study and CKD in the subset of exclusively white patients to ascertain whether study differences have an impact on the effect of CKD on CVD and mortality outcomes in a racially homogeneous group. In addition, other sensitivity analyses (1) compared the model with imputed data with that without imputed data; (2) removed LVH and systolic BP from the model to investigate for overcorrection for factors that may be in the pathway between CKD and CVD; (3) evaluated the effect of CKD on outcomes after additional adjustment for medication usage at baseline; and (4) assessed the effect of anemia on the composite outcome, as previous studies have suggested that anemia may be a risk factor for outcomes in the general population (28) and may modify the impact of CKD (29). Anemia was defined as hematocrit <36% in women and <39% in men. Finally, in a fully adjusted model including anemia, we tested for an interaction between the presence of anemia and CKD. Secondary analyses were performed for the individual outcomes of all-cause mortality, MI/FCHD, and stroke adjusting for covariates that were significant in the fully adjusted model for the composite outcome with an interaction term for race and CKD. Data were analyzed using SAS Version 8.2. The baseline characteristics of 22,634 subjects are displayed in Tables 1 and 2⇓. Blacks composed 18.4% of the study population. The mean serum creatinine for both whites and blacks was 0.9 mg/dl. The mean estimated GFR was 88.6 ml/min per 1.73 m2 for whites and 99.9 ml/min per 1.73 m2 for blacks. CKD was present in 1664 subjects. The CKD group was composed of 1505 (8.1%) white and 159 (3.8%) black subjects; 19% of patients with CKD were from ARIC, 47% were from CHS, 25% were from FHS, and 9% were from Offspring. In patients with CKD, the mean estimated GFR was 51.9 ml/min per 1.73 m2 for whites and 49.6 ml/min per 1.73 m2 for blacks. Because of the large study sample, all study variables were significantly different between the white and black subgroups. The prevalence of traditional CVD risk factors was higher in patients with CKD as compared with those without CKD. Patients with CKD were older and more likely to include those with a history of hypertension and diabetes. The average duration of follow-up was 99 mo for the pooled database, with average follow-up of 98 mo for ARIC, 81 for CHS, 108 for FHS, and 118 for Offspring. There were 2076 total deaths (9.2%), 1279 (5.7%) cardiac events, and 712 (3.1%) strokes. The composite study outcome was reached in 3262 (14.4%) subjects. When compared with subjects without CKD, a higher percentage of subjects with CKD developed each of the study outcomes (Table 3). Subjects with CKD were at significantly greater risk for the composite study outcome (30.1% versus 13.2%) than patients without CKD (Table 3). Our unadjusted analysis showed a hazard ratio (HR) of 2.60 (95% confidence interval [CI], 2.36–2.86) for the composite outcome in subjects with CKD (Figure 1). The fully adjusted HR was significantly higher for patients with CKD as compared with those without CKD (HR, 1.19; 95% CI, 1.07–1.32; Table 4). A higher percentage of blacks (38.4%) than whites (29.2%) with CKD reached the composite end point. There was a significant interaction between CKD and race with the composite outcome (P = 0.002), whereas interactions between CKD and other major CVD risk factors were not statistically significant. The term for the original study was not significant in the final model. On the basis of the interaction model, blacks with CKD had an adjusted HR of 1.76 (95% CI, 1.35–2.31), whereas whites had an adjusted HR of 1.13 (95% CI, 1.02–1.26). Figure 2 shows significantly worse 10-yr probability of survival without reaching a composite study end point in blacks with CKD when compared with whites with CKD. Figure 1. Kaplan-Meier survival analysis for the composite outcome stratified by the presence of chronic kidney disease. Bars represent 95% confidence intervals. Figure 2. Racial differences in the adjusted 10-yr probability of survival to the composite outcome based on level of GFR. Dashed lines represent 95% confidence intervals. In adjusted analyses, patients with CKD had an increased risk of all-cause mortality (HR, 1.36; 95% CI, 1.21–1.53) as compared with those without CKD but no increased risk of MI/FCHD or stroke (Table 4). All-cause mortality was higher in blacks (HR, 1.83; 95% CI, 1.33–2.52) versus whites (HR, 1.31; 95% CI, 1.16–1.49). Blacks with CKD were also at higher risk of cardiac outcomes (HR, 2.09; 95% CI, 1.33–3.26) than whites with CKD (HR, 1.01; 95% CI, 0.84–1.21). Race, however, did not seem to influence the risk of stroke in patients with CKD. Using more liberal definitions of serum glucose in the FHS reduced the number of individuals with diabetes in the Framingham population. There were no differences in hazards among models using the three definitions of diabetes. In addition, we found no significant interaction between study and CKD in exclusively white subjects. We also compared the model with imputed data with that without imputed data and found no significant differences. Models that excluded LVH and systolic BP showed no significant differences from the fully adjusted model. The effect of CKD on outcomes was not changed by inclusion of medication variables in the model. In the fully adjusted model, anemia was noted to be an independent risk factor for the composite outcome (HR, 1.37; 95% CI, 1.21–1.56). The HR for blacks and whites with CKD were essentially unchanged (HR, 1.64; 95% CI, 1.25–2.15; and HR, 1.12; 95% CI, 1.01–1.25, respectively). The interaction term for CKD and anemia did not achieve statistical significance (P > 0.05). The FHS advanced clinical medicine by identifying significant risk factors for the development of CVD (30,31⇓). Our study examines kidney function as an additional risk factor for the development of CVD and mortality in a relatively healthy community-based population. In subjects without a history of CVD, we demonstrated that a lower level of kidney function was associated with an increased risk of the composite outcome of all-cause mortality and CVD. When considering the components of the composite outcome, we noted that the presence of CKD was an independent risk factor for both all-cause mortality and CVD in blacks but only for all-cause mortality in whites. Blacks with CKD were at significantly higher risk than whites with CKD for the composite outcome as well as the components MI/FCHD and all-cause mortality. Previous studies of patients with preexisting CVD or at high risk for CVD have consistently shown an association between decreased kidney function and increased risk of CVD outcomes (4–9,32⇓⇓⇓⇓⇓⇓). Community studies of lower risk patients, however, have been less conclusive. In NHANES I, subjects with moderately elevated serum creatinine levels were not at increased risk for dying compared with those with lower creatinine levels after adjusting for age and underlying CVD. Race-specific findings were not described (13). An examination of members of the FHS and Offspring cohorts, comparing subjects with kidney disease (serum creatinine 1.5–3.0 mg/dl and 1.4–3.0 mg/dl in men and women, respectively) with those without kidney disease also found no significant relationship between the presence of kidney disease and CVD events after adjustment for traditional CVD risk factors. Men with kidney disease, however, were at slightly increased risk of all-cause mortality (14). In contrast, an examination of data from NHANES II using GFR calculated from the MDRD study equation found that risk for all-cause mortality and CVD-related mortality was significantly increased in subjects with GFR <70 ml/min per 1.73 m2 when compared with those ≥90 ml/min per 1.73 m2(16). Examination of the ARIC cohort found an increased risk of CVD events and a trend toward an interaction between GFR and race in patients with CKD (18). Finally, evaluation of CHS also demonstrated that reduced kidney function was an independent risk factor for CVD outcomes (17). We used the MDRD equation to estimate GFR. The MDRD equation was derived and validated in a biracial population with CKD where the majority of GFR values were between 20 and 80 ml/min per 1.73 m2 (32). The race variable in the MDRD equation reflects that blacks have a higher GFR than whites for the same level of creatinine. Recently, in an exclusively black population, a similar relationship between creatinine and GFR was noted (33). We defined CKD as GFR <60 ml/min per 1.73 m2 for several reasons: (1) the current clinical guidelines have adopted this GFR as the cut point for defining CKD; (2) the MDRD equation for estimating GFR was derived in a population that allows reliable estimates about this level; and (3) a GFR <60 ml/min per 1.73 m2 is abnormal in any population, including the elderly. In our study, we noted that a higher percentage of whites had CKD than blacks. A similar relationship was recently noted for moderate CKD in NHANES III (34). Another analysis of the NHANES III data demonstrated that the most striking racial difference was not the prevalence of moderate and severe CKD but rather the more frequent progression to kidney failure among blacks (35). Multiple explanations exist as to why the level of kidney function may be associated with an increased risk for CVD outcomes. A decrease in kidney function may be associated with an increase in other nontraditional risk factors that were not included in the current analysis, including hyperhomocysteinemia, inflammation, and oxidative stress (36). In addition, reduced kidney function may be a marker for both duration and severity of other causes of cardiovascular disease, such as hypertension, and thereby reflect residual confounding from these risk factors. Furthermore, patients with kidney disease likely receive less aggressive therapy for risk-factor modification (7,8,37⇓⇓). Last, reduced kidney function may serve to exacerbate the effects of other CVD risk factors; for example, CKD may potentiate the effect of hypertension and anemia on cardiomyopathy. We noted that the risk associated with CKD seemed to be higher in blacks than in whites. We believe that differences in the study populations are not the primary explanation for this finding as the study term was not significant in the final model. Furthermore, we did not find any interaction between CKD and study with regard to outcomes when we considered a pooled cohort of exclusively white subjects. We acknowledge, however, that we cannot completely rule out that differences in studies may be playing a role, particularly given that many of the black subjects are from one center within the ARIC study. There are several theoretical explanations for why the level of kidney function may affect blacks differently than whites. First, it is possible that the severity of hypertension and diabetes in many blacks is of a magnitude greater than that seen in whites. Blacks are more likely to have hypertension at an earlier age and at any given age have higher systolic and diastolic BP than whites (38). As hypertension is a common cause of moderate CKD, it follows that reduction in kidney function may represent a greater severity of hypertension and end-organ damage secondary to hypertension. This would not be fully accounted for in our regression models. Second, the discrepancy may also be a reflection of socioeconomic disparities in access and utilization of health care, where diagnosis and treatment of risk factors such as hypertension and diabetes may be delayed in the black population. We also noted that the effect of CKD on outcomes was different in blacks and whites. In particular, in the fully adjusted analysis in whites, CKD was only a risk factor for all-cause mortality but not CVD outcomes. Although this issue clearly needs further investigation in future studies, we suggest caution in the overinterpretation of this result. One reason is that fatal CHD may not necessarily include all cardiovascular deaths (e.g., death as a result of heart failure) and therefore our definition of a “CVD” event, although well accepted, may be subject to misclassification, especially when definitions from different studies are combined. Because of this factor and also because of the issue of competing risk between a CVD event and non-CVD mortality, we believe that the composite outcome provides the best representation of the results. Our study has several limitations. Because the public-use database does not provide center information in ARIC and CHS because of confidentiality concerns, we are unable to adjust for differences or clustering of outcomes as a result of center effects in these two studies. We endeavored to control for this by including several socioeconomic variables: education, race, smoking, and alcohol use. Our definition of CKD is based on a single assessment of serum creatinine; although this may introduce misclassification bias, these studies all evaluated subjects when they were at their baseline and presumably free of acute illnesses that may affect serum creatinine. In addition, by stratifying on the basis of level of GFR, we endeavored to minimize misclassification. Although we had a large study population, we had relatively few blacks with CKD. Despite this, the relationship between blacks with CKD and adverse outcomes was highly significant. We also lack data on several more recently identified risk factors for CVD that may be especially prominent in patients with kidney disease, including C-reactive protein (39), homocysteine (40), and albuminuria (41). Finally, we were not able to adjust for changes in medication use during follow-up or to assess the impact that several newer therapies, such as statins and renin-angiotensin-aldosterone system blockade, may have had on CVD outcomes as the initiation of the four studies predated extensive use of these now commonly prescribed medications. However, even without this information, our study adjusts for all of the major history, physical examination, and laboratory items that are checked in a routine patient visit and are used in the Framingham risk equations, making the results applicable to clinical practice. The current study also has several strengths, most significant of which may be the very large sample size that allows us to examine subgroup associations in subjects with moderate and severe CKD. In addition, our pooled cohort is likely generalizable as the individuals are drawn from multiple communities with a broad age range. Last, we calibrated serum creatinine results across all studies to the central laboratory that processed the specimens used to derive the MDRD equation for estimating GFR. This allowed us to standardize creatinine values from several different cohorts. The results of our study suggest that the presence of CKD is an independent risk factor for adverse outcomes in a large, pooled, community-based cohort of patients without CVD. The risk associated with CKD seems to be stronger in blacks than in whites. Our study provides further evidence that patients with CKD should be considered at high risk for CVD and mortality outcomes and identifies patients with CKD as potential candidates for aggressive risk factor reduction. This study was supported by grants K23 NIDDK 02904 and T32DK007777 and by Amgen (Thousand Oaks, CA). The study sponsor was not involved in data analysis or interpretation of findings. This work was presented in part at the Annual Meeting of the American Society of Nephrology, 2003, San Diego, CA. The ARIC, CHS, FHS, Offspring studies are conducted and supported by the National Heart, Lung and Blood Institute (NHLBI) in collaboration with the individual study investigators. This manuscript was not prepared in collaboration with the study investigators and does not necessarily reflect the opinions or views of the study investigators or the NHLBI. Galectin-3 and New-Onset CKD: Marker or Mediator? Screening for Proteinuria: A Tool for Predicting Rapid Declines in Kidney Function?